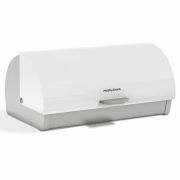 Keep bread and other perishables fresher for longer and do it in style with the Morphy Richards Accents Roll Top Bread Bin. Whether you're using it to store white, granary, sourdough or rye, this roll-top bread bin from the iconic Morphy Richards brand offers practicality and slick design. Constructed from sturdy stainless steel, the bread bin has an eye-catching satin finish coating to lend your kitchen some cool contemporary style. The roll-top lid provides maximum access, while the ventilated body means that whatever you chose to store inside won't go soggy as quick as if kept in non-ventilated bread bins.Features:Sturdy satin stainless steel bodyColour match exterior coating on lidRoll top lid for maximum accessVentilated body for longer freshnessSize: 39cm x 27cm x 19cmColour box packagingColour: WhiteWarranty with RKW: 1 Year.Extended Warranty: 4 Years. Valid only if item is registered within 28 days of receiving it.